The little Beetle Bug is back! Beetle Bug - Alone against the monsters. The little bug Beetle wanted to spend a quiet evening watching TV. Yet, suddenly peculiar monsters emerge. What do these guys want down in the underworld? Help the little bug to preserve the underworld from the evil. But don’t forget to pick up one or another treasure on your way. That will bring important bonus points. And beware: just throw a stone on the monsters, that should help. 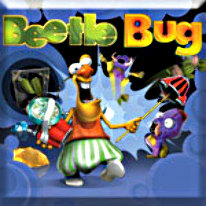 Beetle Bug is perfect action and strategy for young and old.